The story is by Alan Watts. He talks about the zen tea ceremony, which usually involves several stages. The first thing you notice, is the artwork in the hallway. This is presented as a point of reflection before moved through a path or garden to the tea house. The ceremony involves a bowl, a brush, the teacups, the kettle, and the tea. In one particular case, an academic from the West was visiting to experience the zen tea ceremony. The master of the ceremony exhibited the bowl being used for this particular occasion. The bowl was very old (a couple hundred years old) and during the ceremony, the bowl broke. The academic was upset about this, and when visiting again years later, commented on his remorse for destroying an ancient piece of history. Upon hearing the apology, the zen master displayed the same bowl, now with rivulets of gold. 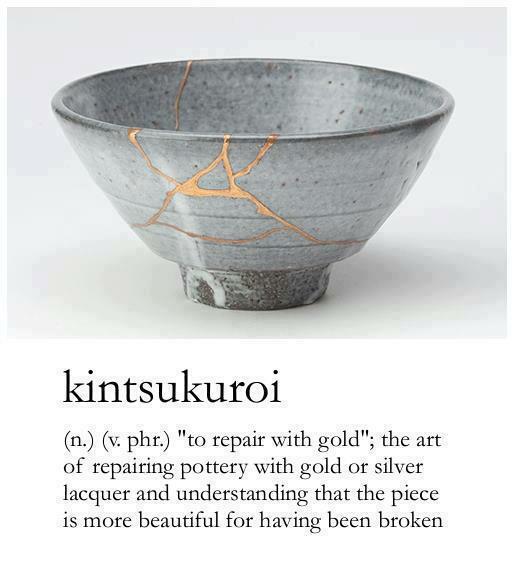 The master had repaired the bowl. The master then told the academic of how much he had improved the bowl. The history of the bowl has been added to, the bowl has been changed by the experience, and there was nothing to be sorry for. Change is inevitable, and even our most holy relics cannot escape.